1کارشناسی ارشد، معاونت پژوهشی جهاد دانشگاهی فارس، شیراز، ایران. 2کارشناسی ارشد، گروه نانوتکنولوژی، معاونت پژوهشی جهاد دانشگاهی فارس، شیراز، ایران. آلودگی آب از مهم‌ترین چالش‌های پیش­رو بر سلامتی انسان و محیط زیست است. در این بین آلودگی ناشی از فلزات سنگین به سبب رشد روزافزون صنایع بسیار نگران‌کننده بوده و مورد توجه قرار دارد. فلزات سنگین می‌توانند زمینه­ بروز بسیاری از بیماری­های خطرناک به­ویژه انواع سرطان­ها را فراهم سازند. کیتوسان، نانوذرات کیتوسان و مشتقات آن­ها به‏علت دارا بودن گروه‌های OH و NH2، غیرسمی بودن، قیمت پایین و در دسترس بودن در طی سال‌های اخیر برای جذب سطحی آلاینده‌ها مخصوصاً فلزات سنگین، توجه بسیاری از محققین را به‏خود جلب کرده‌اند. در این مقاله مروری، آماده‌سازی کیتوسان، نانوذرات کیتوسان و انواع کیتوسان اصلاح‌شده بررسی شده و کاربردهای آن در فرایند جذب فلزات سنگین از محلول‌های آبی به‌طور خلاصه آورده شده است. تأثیر پارامترهای تأثیرگذار بر فرایند جذب نظیر بلوری شدن کیتوسان، میزان غلظت جاذب، غلظت اولیه فلزات سنگین، زمان فرایند، pH محلول و دما و همچنین ایزوترم و سینتیک جذب مورد بررسی قرار گرفته­اند. 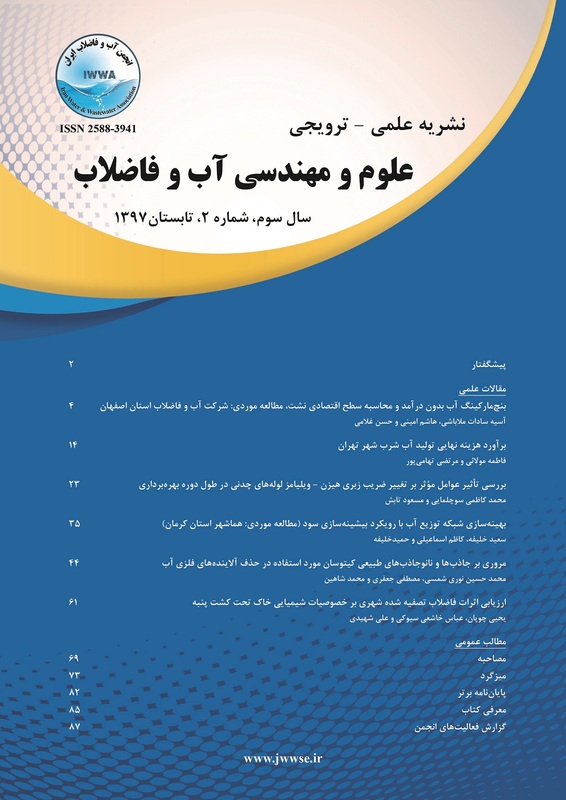 در ادامه روش پاسخ سطح توضیح داده شده و روش‌های متداول برای بهینه‌یابی پارامترهای فرایندی جذب سطحی برای فلزات سنگین استفاده شده است. در نهایت بازیابی جاذب‌های بر پایه کیتوسان و استفاده مجدد از آن‌ها در فرایند جذب نیز مورد ارزیابی قرار گرفته است. Aliabadi, M., Irani, M., Ismaeili, J., and Najafzadeh, S., (2014), "Design and evaluation of chitosan/hydroxyapatite composite nanofiber membrane for the removal of heavy metal ions from aqueous solution", Journal of the Taiwan Institute of Chemical Engineers, 45(2), 518-526. Alizadeh, B., Delnavaz, M., and Shakeri, A., (2018), "Removal of Cd (ӀӀ) and phenol using novel cross-linked magnetic EDTA/chitosan/TiO2 nanocomposite", Carbohydrate Polymers, 181, 675-683. Anirudhan, T. S., and Sreekumari, S. S., (2011), "Adsorptive removal of heavy metal ions from industrial effluents using activated carbon derived from waste coconut buttons", Journal of Environmental Sciences, 23(12), 1989-1998. Babel, S., and Kurniawan, T.A., (2003), "Low-cost adsorbents for heavy metals uptake from contaminated water: a review", Journal of Hazardous Materials, 97(1-3), 219-243. Becker, T., Schlaak, M., and Strasdeit, H., (2000), "Adsorption of nickel (II), zinc (II) and cadmium (II) by new chitosan derivatives", Reactive and Functional Polymers, 44(3), 289-298. Bezerra, M.A., Santelli, R.E., Oliveira, E.P., Villar, L.S., and Escaleira, L.A., (2008), "Response surface methodology (RSM) as a tool for optimization in analytical chemistry", Talanta, 76(5), 965-977. Bhatt, R., Sreedhar, B., and Padmaja, P., (2015), "Adsorption of chromium from aqueous solutions using crosslinked chitosan–diethylenetriaminepentaacetic acid", International Journal of Biological Macromolecules, 74, 458-466. Bodnar, M., Hartmann, J.F., and Borbely, J., (2005), "Preparation and characterization of chitosan-based nanoparticles", Biomacromolecules, 6(5), 2521-2527. Chang, Y.-C., Chang, S.-W., and Chen, D.-H., (2006), "Magnetic chitosan nanoparticles: Studies on chitosan binding and adsorption of Co (II) ions", Reactive and Functional Polymers, 66(3), 335-341. Chang, Y.-C., and Chen, D.-H., (2005), "Preparation and adsorption properties of monodisperse chitosan-bound Fe3O4 magnetic nanoparticles for removal of Cu (II) ions", Journal of Colloid and Interface Science, 283(2), 446-451. Chauhan, D., Dwivedi, J., and Sankararamakrishnan, N., (2014), "Novel chitosan/PVA/zerovalent iron biopolymeric nanofibers with enhanced arsenic removal applications", Environmental Science and Pollution Research, 21(15), 9430-9442. Chen, D., Li, W., Wu, Y., Zhu, Q., Lu, Z., and Du, G., (2013), "Preparation and characterization of chitosan/montmorillonite magnetic microspheres and its application for the removal of Cr (VI)", Chemical Engineering journal, 221, 8-15. Cho, D.-W., Jeon, B.-H., Chon, C.-M., Kim, Y., Schwartz, F.W., Lee, E.-S., and Song, H., (2012), "A novel chitosan/clay/magnetite composite for adsorption of Cu (II) and As (V)", Chemical Engineering Journal, 200, 654-662. Chowdhury, S., Mishra, R., Saha, P., and Kushwaha, P., (2011), "Adsorption thermodynamics, kinetics and isosteric heat of adsorption of malachite green onto chemically modified rice husk", Desalination, 265(1), 159-168. Dąbrowski, A., (2001), "Adsorption: From theory to practice", Advances in Colloid and Interface Science, 93(1), 135-224. Debnath, S., Maity, A., and Pillay, K., (2014), "Magnetic chitosan–GO nanocomposite: synthesis, characterization and batch adsorber design for Cr (VI) removal", Journal of Environmental Chemical Engineering, 2(2), 963-973. Dhanapal, V., and Subramanian, K., (2015), "Modified chitosan for the collection of reactive blue 4, arsenic and mercury from aqueous media", Carbohydrate Polymers, 117, 123-132. Du, J., Zhang, L., Gao, H., and Liao, Y., (2017), "Removal of methylene blue from aqueous solutions using Poly (AA-co-DVB)", Journal of Dispersion Science and Technology, 38(10), 1489-1494. El-Reash, Y.G.A., Otto, M., Kenawy, I.M., and Ouf, A.M., (2011), "Adsorption of Cr (VI) and As (V) ions by modified magnetic chitosan chelating resin", International Journal of Biological Macromolecules, 49(4), 513-522. Eser, A., Tirtom, V.N., Aydemir, T., Becerik, S., and Dinçer, A., (2012), "Removal of nickel (II) ions by histidine modified chitosan beads", Chemical Engineering Journal, 210, 590-596. Fan, C., Li, K., Li, J., Ying, D., Wang, Y., and Jia, J., (2017), "Comparative and competitive adsorption of Pb (II) and Cu (II) using tetraethylenepentamine modified chitosan/CoFe2O4 particles", Journal of Hazardous Materials, 326, 211-220. Febrianto, J., Kosasih, A.N., Sunarso, J., Ju, Y.-H., Indraswati, N., and Ismadji, S., (2009), "Equilibrium and kinetic studies in adsorption of heavy metals using biosorbent: a summary of recent studies", Journal of Hazardous Materials, 162(2-3), 616-645. Gamage, A., and Shahidi, F., (2007), "Use of chitosan for the removal of metal ion contaminants and proteins from water", Food Chemistry, 104(3), 989-996. Gandhi, M.R., and Meenakshi, S., (2013), "Preparation of amino terminated polyamidoamine functionalized chitosan beads and its Cr (VI) uptake studies", Carbohydrate Polymers, 91(2), 631-637. Gogoi, P., Thakur, A.J., Devi, R.R., Das, B., and Maji, T.K., (2016), "A comparative study on sorption of arsenate ions from water by crosslinked chitosan and crosslinked chitosan/MMT nanocomposite", Journal of Environmental Chemical Engineering, 4(4), 4248-4257. Gokila, S., Gomathi, T., Sudha, P.N., and Anil, S., (2017), "Removal of the heavy metal ion chromiuim (VI) using Chitosan and Alginate nanocomposites", International Journal of Biological Macromolecules, 104, 1459-1468. He, J., Lu, Y., and Luo, G., (2014), "Ca (II) imprinted chitosan microspheres: An effective and green adsorbent for the removal of Cu (II), Cd (II) and Pb (II) from aqueous solutions", Chemical Engineering Journal, 244, 202-208. Hu, X., Wang, J., Liu, Y., Li, X., Zeng, G., Bao, Z., Zeng, X., Chen, A., and Long, F., (2011), "Adsorption of chromium (VI) by ethylenediamine-modified cross-linked magnetic chitosan resin: isotherms, kinetics and thermodynamics", Journal of Hazardous Materials, 185(1), 306-314. Huang, C., Chung, Y.-C., and Liou, M.-R., (1996), "Adsorption of Cu (II) and Ni (II) by pelletized biopolymer", Journal of Hazardous Materials, 45(2-3), 265-277. Igberase, E., Osifo, P., and Ofomaja, A., (2017), "Chromium (VI) ion adsorption by grafted cross-linked chitosan beads in aqueous solution: A mathematical and statistical modeling study", Environmental Technology, 38(24), 3156-3166. Igder, A., Rahmani, A.A., Fazlavi, A., Ahmadi, M.H., Azqhandi, A., Hossein, M., and Omidi, M.H., (2012), "Box-behnken design of experiments investigation for adsorption of Cd2+ onto carboxymethyl chitosan magnetic nanoparticles", Journal of Mining and Environment, 3(1), 51-59. Inoue, K., Ohto, K., Yoshizuka, K., Yamaguchi, T., and Tanaka, T., (1997), "Adsorption of lead (II) ion on complexane types of chemically modified chitosan", Bulletin of the Chemical Society of Japan, 70(10), 2443-2447. Jansson-Charrier, M., Guibal, E., Roussy, J., Delanghe, B., and Le Cloirec, P., (1996), "Vanadium (IV) sorption by chitosan: Kinetics and equilibrium", Water Research, 30(2), 465-475. Jiang, Y.-J., Yu, X.-Y., Luo, T., Jia, Y., Liu, J.-H., and Huang, X.-J., (2013), "γ-Fe2O3 nanoparticles encapsulated millimeter-sized magnetic chitosan beads for removal of Cr (VI) from water: Thermodynamics, kinetics, regeneration, and uptake mechanisms", Journal of Chemical and Engineering Data, 58(11), 3142-3149. Karthik, R., and Meenakshi, S., (2015), "Removal of Pb (II) and Cd (II) ions from aqueous solution using polyaniline grafted chitosan", Chemical Engineering Journal, 263, 168-177. Kizilkaya, B., (2012), "Usage of biogenic apatite (fish bones) on removal of basic fuchsin dye from aqueous solution", Journal of Dispersion Science and Technology, 33(11), 1596-1602. Kumar, A. S. K., and Jiang, S.-J., (2016), "Chitosan-functionalized graphene oxide: A novel adsorbent an efficient adsorption of arsenic from aqueous solution", Journal of environmental chemical engineering, 4(2), 1698–1713. Kumar, M., Tripathi, B.P., and Shahi, V.K., (2009), "Crosslinked chitosan/polyvinyl alcohol blend beads for removal and recovery of Cd (II) from wastewater", Journal of Hazardous Materials, 172(2-3), 1041-1048. Kyzas, G.Z., Kostoglou, M., and Lazaridis, N.K., (2009), "Copper and chromium (VI) removal by chitosan derivatives, Equilibrium and kinetic studies", Chemical Engineering Journal, 152(2-3), 440-448. Li, J., Jiang, B., Liu, Y., Qiu, C., Hu, J., Qian, G., Guo, W., and Ngo, H.H., (2017), "Preparation and adsorption properties of magnetic chitosan composite adsorbent for Cu2+ removal", Journal of Cleaner Production, 158, 51-58. Li, X., Zhou, H., Wu, W., Wei, S., Xu, Y., and Kuang, Y., (2015), "Studies of heavy metal ion adsorption on Chitosan/Sulfydryl-functionalized graphene oxide composites", Journal of Colloid and Interface Science, 448, 389-397. Liu, B., Lv, X., Wang, D., Xu, Y., Zhang, L., and Li, Y., (2012), "Adsorption behavior of As (III) onto chitosan resin with As (III) as template ions", Journal of Applied Polymer Science, 125(1), 246-253. Liu, Q., Yang, B., Zhang, L., and Huang, R., (2015), "Adsorptive removal of Cr (VI) from aqueous solutions by cross-linked chitosan/bentonite composite", Korean Journal of Chemical Engineering, 32(7), 1314-1322. Liu, T., Zhao, L., Sun, D., and Tan, X., (2010), "Entrapment of nanoscale zero-valent iron in chitosan beads for hexavalent chromium removal from wastewater", Journal of Hazardous Materials, 184(1-3), 724-730. Liu, X., Hu, Q., Fang, Z., Zhang, X., and Zhang, B., (2008), "Magnetic chitosan nanocomposites: A useful recyclable tool for heavy metal ion removal", Langmuir, 25(1), 3-8. Luo, X., Zeng, J., Liu, S., and Zhang, L., (2015), "An effective and recyclable adsorbent for the removal of heavy metal ions from aqueous system: magnetic chitosan/cellulose microspheres", Bioresource Technology, 194, 403-406. Maity, J., and Ray, S.K., (2018), "Chitosan based nano composite adsorbent: Synthesis, characterization and application for adsorption of binary mixtures of Pb (II) and Cd (II) from water", Carbohydrate Polymers, 182, 159-171. Malliou, E., Loizidou, M., and Spyrellis, N., (1994), "Uptake of lead and cadmium by clinoptilolite", Science of the Total Environment, 149(3), 139-144. Manju, G.N., Raji, C., and Anirudhan, T.S., (1998), "Evaluation of coconut husk carbon for the removal of arsenic from water", Water Research, 32(10), 3062-3070. Marković, S., Stanković, A., Lopičić, Z., Lazarević, S., Stojanović, M., and Uskoković, D., (2015), "Application of raw peach shell particles for removal of methylene blue", Journal of Environmental Chemical Engineering, 3(2), 716-724. Mckay, G., Blair, H.S., and Findon, A., (1989), "Equilibrium studies for the sorption of metal-ions onto chitosan", Indian Journal of Chemistry Section A, Inorganic Bio-Inorganic Physical Theoretical and Analytical Chemistry, 28(5), 356-360. Monier, M., Ayad, D.M., and Abdel-Latif, D.A., (2012), "Adsorption of Cu (II), Cd (II) and Ni (II) ions by cross-linked magnetic chitosan-2-aminopyridine glyoxal Schiff’s base", Colloids and Surfaces B: Biointerfaces, 94, 250-258. Muzzarelli, R.A.A., Weckx, M., Filippini, O., and Sigon, F., (1989), "Removal of trace metal ions from industrial waters, nuclear effluents and drinking water, with the aid of cross-linked N-carboxymethyl chitosan", Carbohydrate polymers, 11(4), 293-306. Namasivayam, C., and Senthilkumar, S., (1998), "Removal of arsenic (V) from aqueous solution using industrial solid waste: adsorption rates and equilibrium studies", Industrial and Engineering Chemistry Research, 37(12), 4816-4822. Ngah, W.S.W., Teong, L.C., Toh, R.H., and Hanafiah, M., (2013), "Comparative study on adsorption and desorption of Cu (II) ions by three types of chitosan–zeolite composites", Chemical Engineering Journal, 223, 231-238. Nithya, R., Gomathi, T., Sudha, P.N., Venkatesan, J., Anil, S., and Kim, S.-K., (2016), "Removal of Cr (VI) from aqueous solution using chitosan-g-poly (butyl acrylate)/silica gel nanocomposite", International Journal of Biological Macromolecules, 87, 545-554. Nuhoglu, Y., Malkoc, E., Gürses, A., and Canpolat, N., (2002), "The removal of Cu (II) from aqueous solutions by Ulothrix zonata", Bioresource Technology, 85(3), 331-333. Othman, Z.A., Hashem, A., and Habila, M.A., (2011), "Kinetic, equilibrium and thermodynamic studies of cadmium (II) adsorption by modified agricultural wastes", Molecules, 16(12), 10443-10456. Peniche‐Covas, C., Alvarez, L.W., and Argüelles‐Monal, W., (1992), "The adsorption of mercuric ions by chitosan", Journal of Applied Polymer Science, 46(7), 1147-1150. Periasamy, K., and Namasivayam, C., (1995), "Removal of nickel (II) from aqueous solution and nickel plating industry wastewater using an agricultural waste: peanut hulls", Waste Management, 15(1), 63-68. Piron, E., Accominotti, M., and Domard, A., (1997), "Interaction between chitosan and uranyl ions. Role of physical and physicochemical parameters on the kinetics of sorption", Langmuir, 13(6), 1653-1658. Piron, E., and Domard, A., (1998), "Interaction between chitosan and uranyl ions, Part 2: Mechanism of interaction", International Journal of Biological Macromolecules, 22(1), 33-40. Qi, L., and Xu, Z., (2004), "Lead sorption from aqueous solutions on chitosan nanoparticles", Colloids and Surfaces A: Physicochemical and Engineering Aspects, 251(1-3), 183-190. Rahimi, S., Moattari, R.M., Rajabi, L., and Derakhshan, A.A., (2015), "Optimization of lead removal from aqueous solution using goethite/chitosan nanocomposite by response surface methodology", Colloids and Surfaces A: Physicochemical and Engineering Aspects, 484, 216-225. Reddy, D.H.K., and Lee, S.-M., (2013), "Application of magnetic chitosan composites for the removal of toxic metal and dyes from aqueous solutions", Advances in Colloid and Interface Science, 201, 68-93. Repo, E., Warchoł, J.K., Bhatnagar, A., and Sillanpää, M., (2011), "Heavy metals adsorption by novel EDTA-modified chitosan–silica hybrid materials", Journal of Colloid and Interface Science, 358(1), 261-267. Rorrer, G.L., Hsien, T.Y., and Way, J.D., (1993), "Synthesis of porous-magnetic chitosan beads for removal of cadmium ions from wastewater", Industrial and Engineering Chemistry Research, 32(9), 2170-2178. Rorrer, G.L., and Way, J.D., (2002), "Chitosan beads to remove heavy metal from wastewater", Dalwoo-ChitoSan, 5, 2170-2178. Saber-Samandari, S., Saber-Samandari, S., Nezafati, N., and Yahya, K., (2014), "Efficient removal of lead (II) ions and methylene blue from aqueous solution using chitosan/Fe-hydroxyapatite nanocomposite beads", Journal of Environmental Management, 146, 481-490. Saha, S., and Sarkar, P., (2012), "Arsenic remediation from drinking water by synthesized nano-alumina dispersed in chitosan-grafted polyacrylamide", Journal of Hazardous Materials, 227, 68-78. Sarkar, M., and Majumdar, P., (2011), "Application of response surface methodology for optimization of heavy metal biosorption using surfactant modified chitosan bead", Chemical Engineering Journal, 175, 376-387. Shankar, P., Gomathi, T., Vijayalakshmi, K., and Sudha, P.N., (2014), "Comparative studies on the removal of heavy metals ions onto cross linked chitosan-g-acrylonitrile copolymer", International Journal of Biological Macromolecules, 67, 180-188. Sheshmani, S., Nematzadeh, M.A., Shokrollahzadeh, S., and Ashori, A., (2015), "Preparation of graphene oxide/chitosan/FeOOH nanocomposite for the removal of Pb (II) from aqueous solution", International Journal of Biological Macromolecules, 80, 475-480. Sivakami, M.S., Gomathi, T., Venkatesan, J., Jeong, H.-S., Kim, S.-K., and Sudha, P.N., (2013), "Preparation and characterization of nano chitosan for treatment wastewaters", International Journal of Biological Macromolecules, 57, 204-212. Sutirman, Z.A., Sanagi, M.M., Karim, J.A., Naim, A.A., and Ibrahim, W.A.W., (2018), "New crosslinked-chitosan graft poly (N-vinyl-2-pyrrolidone) for the removal of Cu (II) ions from aqueous solutions", International Journal of Biological Macromolecules, 107, 891-897. Tan, Z., Peng, H., Liu, H., Wang, L., Chen, J., and Lu, X., (2015), "Facile preparation of EDTA‐functionalized chitosan magnetic adsorbent for removal of P b (II)", Journal of Applied Polymer Science, 132(32), 1-10. Turan, D., Kocahakimoğlu, C., Boyacı, E., Sofuoglu, S.C., and Eroğlu, A.E., (2014), "Chitosan-immobilized pumice for the removal of As (V) from waters", Water, Air and Soil Pollution, 225(5), 1931. Wang, J., and Chen, C., (2006), "Biosorption of heavy metals by Saccharomyces cerevisiae: a review", Biotechnology Advances, 24(5), 427-451. Wang, J., and Chen, C., (2009), "Biosorbents for heavy metals removal and their future", Biotechnology Advances, 27(2), 195-226. Wang, L., Xing, R., Liu, S., Yu, H., Qin, Y., Li, K., Feng, J., Li, R., and Li, P., (2010), "Recovery of silver (I) using a thiourea-modified chitosan resin", Journal of Hazardous Materials, 180(1-3), 577-582. Wang, Y., Li, L., Luo, C., Wang, X., and Duan, H., (2016), "Removal of Pb2+ from water environment using a novel magnetic chitosan/graphene oxide imprinted Pb2+", International Journal of Biological Macromolecules, 86, 505-511. Witek-Krowiak, A., Chojnacka, K., Podstawczyk, D., Dawiec, A., and Pokomeda, K., (2014), "Application of response surface methodology and artificial neural network methods in modelling and optimization of biosorption process", Bioresource Technology, 160, 150-160. Xie, M., Zeng, L., Zhang, Q., Kang, Y., Xiao, H., Peng, Y., Chen, X., and Luo, J., (2015), "Synthesis and adsorption behavior of magnetic microspheres based on chitosan/organic rectorite for low-concentration heavy metal removal", Journal of Alloys and Compounds, 647, 892-905. Xu, Y., Nakajima, T., and Ohki, A., (2002), "Adsorption and removal of arsenic (V) from drinking water by aluminum-loaded Shirasu-zeolite", Journal of Hazardous Materials, 92(3), 275-287. Yavuz, A.G., Dincturk-Atalay, E., Uygun, A., Gode, F., and Aslan, E., (2011), "A comparison study of adsorption of Cr (VI) from aqueous solutions onto alkyl-substituted polyaniline/chitosan composites", Desalination, 279(1-3), 325-331. Zavareh, S., Zarei, M., Darvishi, F., and Azizi, H., (2015), "As (III) adsorption and antimicrobial properties of Cu–chitosan/alumina nanocomposite", Chemical Engineering Journal, 273, 610-621. Zhang, L., Luo, H., Liu, P., Fang, W., and Geng, J., (2016), "A novel modified graphene oxide/chitosan composite used as an adsorbent for Cr (VI) in aqueous solutions", International Journal of Biological Macromolecules, 87, 586-596. Zhang, L., Xia, W., Teng, B., Liu, X., and Zhang, W., (2013), "Zirconium cross-linked chitosan composite: Preparation, characterization and application in adsorption of Cr (VI)", Chemical Engineering Journal, 229, 1-8. Zhang, Y., Yan, T., Yan, L., Guo, X., Cui, L., Wei, Q., and Du, B., (2014), "Preparation of novel cobalt ferrite/chitosan grafted with graphene composite as effective adsorbents for mercury ions", Journal of Molecular Liquids, 198, 381-387. Zhou, Y.-T., Nie, H.-L., Branford-White, C., He, Z.-Y., and Zhu, L.-M., (2009), "Removal of Cu2+ from aqueous solution by chitosan-coated magnetic nanoparticles modified with α-ketoglutaric acid", Journal of Colloid and Interface Science, 330(1), 29-37. Zhu, C., Luan, Z., Wang, Y., and Shan, X., (2007), "Removal of cadmium from aqueous solutions by adsorption on granular red mud (GRM)", Separation and Purification Technology, 57(1), 161-169. Zimmermann, A.C., Mecabô, A., Fagundes, T., and Rodrigues, C.A., (2010), "Adsorption of Cr (VI) using Fe-crosslinked chitosan complex (Ch-Fe)", Journal of Hazardous Materials, 179(1-3), 192-196.